a term originally used to refer to the heat-labile factor in serum that causes immune cytolysis (lysis of antibody-coated cells). It is now used to refer to the entire functionally related system comprising at least 20 distinct serum proteins, their cellular receptors, and related regulatory proteins; this system is the effector not only of immune cytolysis but also of other biologic functions including anaphylaxis, phagocytosis, opsonization, and hemolysis. Complement activation occurs by two different sequences, the classical pathway and the alternative pathway. All of the “components of complement,” designated C1 through C9 (C1 being composed of three distinct proteins, C1q, C1r, and C1s), participate in the classical pathway; the alternative pathway lacks components C1, C2, and C4 but adds factor b, factor d, and properdin. Regulatory proteins include factor h, factor i, clusterin, C3 nephritic factor, decay accelerating factor, homologous restriction factor, C1 inhibitor, C4 binding protein, membrane cofactor protein, protectin, and vitronectin. The classical pathway is primarily activated by the binding of C1 to antigen-antibody complexes containing the immunoglobulins IgM or IgG. The alternative pathway can be activated by IgA immune complexes and also by nonimmunologic materials including bacterial endotoxins, microbial polysaccharides, and cell walls. Activation of the classical pathway triggers an enzymatic cascade involving C1, C4, C2, and C3; activation of the alternative pathway triggers a cascade involving C3 and factors B and D and properdin. Both pathways result in cleavage of C5 and formation of the membrane attack complex, which in its final state creates a pore in the cell wall and causes cell lysis. Complement activation also results in the formation of many biologically active complement fragments that act as anaphylatoxins, opsonins, or chemotactic factors. Fragments resulting from proteolytic cleavage of complement proteins are designated with lower-case-letter suffixes, e.g., C3a. 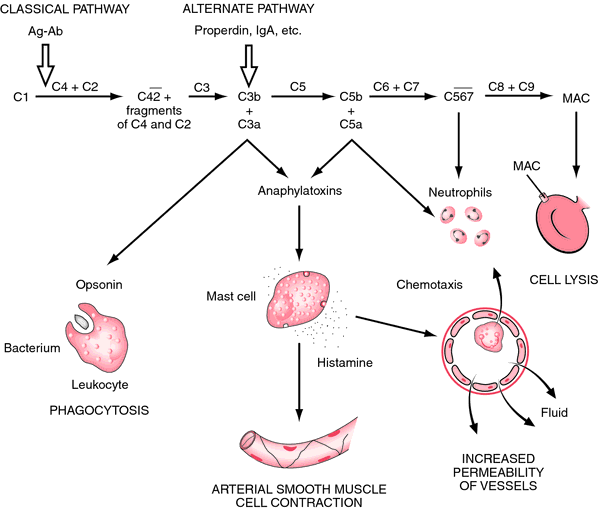 Complement activation. Activation of the classical and alternative pathways leads to a common terminal pathway from C5 to C9. These complement components form the final membrane attack complex (MAC). Other intermediate complexes and fragments are also biologically active: opsonins facilitate phagocytosis, anaphylatoxins act on mast cells and mediate a release of histamine which acts on blood vessels, and chemotactic fragments and intermediate complexes attract leukocytes to the site of inflammation. Redrawn from Damjanov, 2000.
complement fixation the combining of complement with the antigen-antibody complex, rendering the complement inactive, or fixed. Its presence or absence as free, active complement can be shown by adding sensitized blood cells to the mixture. If free complement is present, hemolysis occurs; if not, no hemolysis is observed. This reaction is the basis of many serologic tests for infection, including the wassermann test for syphilis, and reactions for gonococcus infection, glanders, typhoid fever, tuberculosis, and amebiasis. Called also Bordet-Gengou phenomenon. See also immunity. complement fixation tests tests that use antigen-antibody reaction and result in hemolysis to determine the presence of various organisms in the blood; see also complement fixation. 1. the act or operation of holding, suturing, or fastening in a fixed position. 3. in psychiatry, a term with two related but distinct meanings: (a) arrest of development at a particular stage (if this is temporary it is a normal reaction to difficulties, but if continued it is a cause of emotional problems); and (b) a close and suffocating attachment to some person, especially a childhood figure such as a parent. 4. in microscopy, the treatment of material so that its structure can be examined in greater detail with minimal alteration of the normal state, and also to provide information concerning the chemical properties (as of cell constituents) by interpretation of fixation reactions. 5. in chemistry, the process whereby a substance is removed from the gaseous or solution phase and localized, as in carbon dioxide or nitrogen fixation. 7. in film processing, the chemical removal of all unexposed and undeveloped silver compounds of the film emulsion, as on x-ray films. complement fixation see complement fixation. 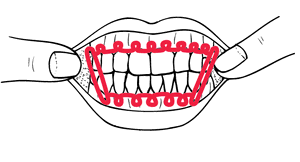 intermaxillary fixation (IMF) a technique used to stabilize a fractured jaw; the teeth are wired or banded together. Extreme caution must be exercised to insure that oral secretions and vomitus are not aspirated as the patient is unable to expectorate any fluids. Antiemetics are often administered to prevent vomiting. Wire cutters should be kept with the patient at all times. Teeth wired in intermaxillary fixation. From Ignatavicius et al., 1995.
the phenomenon of complement fixation; when complement-containing serum is added to a mixture of bacteria and specific antibody, the complement is removed (fixed) and is not available to lyse subsequently added erythrocytes sensitized with specific antibody. Gengou phenomenon - noncellular antigens.